I've been bombarding you with reviews lately and I thought it's time we do something different. I had the opportunity to interview the ABSOLUTELY lovely Erin Summerill, which was organised by her lovely publishers, HMH Teen. Her debut series, a duology (Clash Of Kingdoms), with the two books titled Ever The Hunted and Ever The Brave and the both of them are a) GORGEOUS and b) I can't WAIT to read them. Scroll down and see the lovely interview that I did with Erin and I hope you love it! 1. If you could teleport into any place (real or fictional) where would you first go? Ah! I want to go to so many places. I want to go to Alaska and see the northern lights. I want to go to Rome and see the Vatican. I want to explore Machu Picchu. I want to see the Serengeti at sunset. I want to go on a castle tour in Germany and France! I have to stop, because I could go on forever. But if I had to pick one to go to first, I would want to go back to Hawaii, and spend time with my grandmother again. 2. Which five fictional characters would you take with you on a heist? I would take: Darrow, from Red Rising - he's the perfect lead. Gen from The Theif - he is the trickster. Katsa from Graceling - she survives everything! Rhysand from A Court of Mist and Fury because he's just perfect. And Britta from Ever The Hunted, because she's clever and soft-footed. 3. What are some of your favourite 2017 book covers? 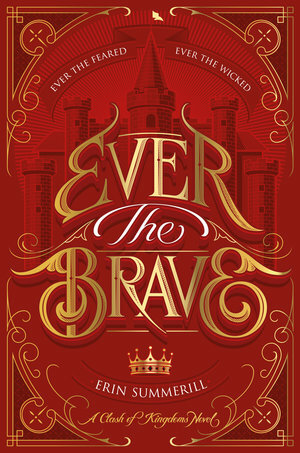 Without sounding glib or like a braggart, I love EVER THE BRAVE's cover. It is my most favorite cover ever and all the credit goes to Houghton Mifflin Harcourt and the artist, Martin Schmetzer. But I really love The Wish Granter by CJ Redwine. That cover is so striking and unique to me. 4. For those readers who haven't read wither Ever The Brave or Ever The Hunted yet, could you tell them a little about what the series is about? It's about a girl, Britta, who must track down her father's killer before the killer gets her. The problem is, the accused is the one boy she loves, Cohen. These books are an adventure and mystery and romance rolled into one! 5. If you could give one piece of advice to your main characters, what would it be? Be vulnerable and open yourself to new ideas and relationships. 6. Are you a plotter of a pantser or somewhere in between? How did writing books one and two differ from each other? I'm somewhere in the middle. I know the main points of the story before I begin (the start, the middle, the end, and the source of conflict). Then I start writing and often try to write through scenes without a plan. 7. What were your first thoughts when you saw the cover for Ever The Hunted? What was the design process like? OH my! I cried. I saw how beautiful the font and design was and tears dripped down my cheeks because I was so happy. Authors often have little say in what their covers look like, so when I saw mine I felt like I had won the cover lottery! Blurb Description: Ever the Divided. Ever the Feared. 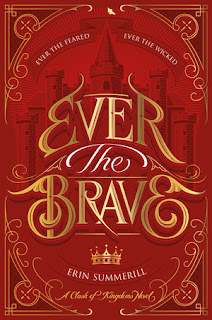 Ever the Brave.After saving King Aodren with her newfound Channeler powers, Britta only wants to live a peaceful life in her childhood home. Unfortunately, saving the King has created a tether between them she cannot sever, no matter how much she'd like to, and now he's insisting on making her a noble lady. And there are those who want to use Britta’s power for evil designs. If Britta cannot find a way to harness her new magical ability, her life—as well as her country—may be lost. Have you had the chance to read the Clash of Kingdoms series yet? I can't wait for hear from you. Also, don't forget to say hi to Erin in the comments. I'm sure she'd love to hear from you.